Nizar Rayyan - Who is Nizar Rayyan? Nizar Abdul Kader Mohammed Rayyan was born on March 6, 1959, in the Jabaliya refugee camp in the Gaza Strip. He attended universities in Saudi Arabia, Jordan, and Sudan, where he received a PhD in Islamic studies. Back in Gaza, Rayyan served as a preacher at several mosques and as a professor of Islamic law at the Islamic University. Married to four women, Rayyan was a father of six sons, six daughters and a grandfather of two. Fundamentally opposed to the state of Israel, Rayyan once proclaimed: "We will never recognise Israel. There is nothing called Israel, neither in reality nor in the imagination." Rayyan was arrested several times by Israel and the Palestinian Authority (PA) before Hamas took control of the strip in June 2007. He was among a group of Hamas leaders who founded the Islamic Salvation Party when the Palestinian Authority was formed in 1994. He was also engaged in Hamas's negotiations with the Palestinian factions and served as one of the main political leaders of the movement. An influential preacher at what is known in Jabaliya as the "Mosque of martyrs", Rayyan supported suicide bombers. He even sent his own son on a suicide mission, which left two Israelis killed at Rlei Sinai. After Hamas ceased suicide bombings against Israel, he advocated for their renewal. 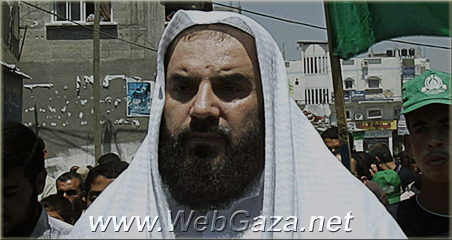 In 2004, Rayyan became Hamas's highest religious leader after the Israeli forces killed Sheikh Ahmed Yassin. Rayyan was the mastermind of the Ashdod Port attack in Israel, which killed 10 people in 2004. He was one of the architects of the factional fighting between Fatah and Hamas in Gaza in 2007 that resulted in Hamas taking control of the Gaza Strip. Rayyan, his four wives and 11 of his children were killed in an Israeli strike on his residence on January 1, 2009. Gaza – Ma’an – One of the surviving daughters of slain Hamas leader Nizar Rayyan, Walaa, spoke to Ma’an Saturday. She is married with two young daughters, but hopes for a son so she can name him after her dead father. Three of her nephews already go by the nickname “Abu Nizar,” though their names are Bilal, Baraa and Muhammad. Walaa’s mother, father, ten brothers and sisters and Rayyan’s three other wives were killed during an Israeli airstrike on the family home. In the days before the attack that killed most of the family Walaa said “My father couldn’t sleep…after a woman came to him complaining that she had nothing with which to feed her children and had to soak days-old bread and give it to them. “Oh my God! We reached a point that a woman doesn’t have anything to feed her children?” she remembers her father saying. Walaa recalls her father with great emotion, and tells the story of how he used to introduce himself as Nizar Abd Al-Qadir Rayyan Al-Asqalani An-Na’lawani Al-Filistiniy, or Nizar Abd Al-Qadir Rayyan from the villages of An-Na’lawani (a destroyed Palestinian village in Israel) and Asqalani (the current Ashkelon) of Palestine. She says he told many stories about the village of Na’lawa or (Niilya) , and would remember the village as long as she lived. One hour before he was killed Rayyan’s daughter in law Eyman Asfora went to visit him. Walaa remembers that Eyman, wife to Rayyan’s eldest son Bilal, was received with a smile. He asked her if she would like to die a martyr with him, and she said “yes.” But she left seconds before the missile struck the four-storey home. The one ton Israeli missile that fell on the building leveled the home and damaged several adjacent houses. When the dust cleared neighbors and media members rushed to the scene to see what happened, and found only piles of concrete. According to one of his four wives, Rayyan would tease his children in the days before his death, and ask them: “Who wants to die martyr with me?” and all his children used to answer, “Yes daddy, we all want to be with you alive or dead.” His youngest son said, “I can’t imagine that you die martyr and leave me behind unable to see you. I want to die with you. Dr Rayyan, who held a PHD in Hadith (the profit Muhammad’s narrated teachings), was killed along with his four wives, Hayam Timraz, Nawal Kahlout, Eyman Kassab, Sherin Udwan, and ten of his children, Ghassan, Abdul-Qadir, Ayah, Maryam, Zaynab, Abdul-Rahman, Aysha, Halima, Osama and Reem who were between four and 17-years-old.